Shop locally for a vibrant community! Sustainable North Grenville invites you to join us for some seasonal cheer at our annual get-together and Give North Grenville silent auction. The event takes place on Tuesday, 6th December from 6.30-9pm at the Maplewood Hall in Oxford Mills and features specialty items gathered from local merchants and artisans. To be a sustainable community it is important to support your local economy by buying from local businesses and artisans. Why not commit to buying at least some of your gifts this year in the Kemptville and Merrickville area? Shopping locally supports your family and friends who rely on the jobs that local businesses provide as well as the choice and ready availability of many amenities and services which keep our community vibrant. Use it or lose it! Among our many offerings this year is a beautiful Ashford Traditional Spinning Wheel. Thank you to Arn and Jan Snyder of Forest Row Farm for this amazing contribution. Thank you also to our other generous supporters so far: Love My Buns, Ahimsa Yoga, Graeme’s Bakery, Vincent Spa Garage, Business Strategies, Aubin Farm, Geronimos, Body and Sole, Downtowne Ice Cream Shoppe, as well as hand-made items from crafty individuals. Thank you in advance to our additional contributors. Find out more by following Sustainable North Grenville on Facebook and see photos of some of the items to be auctioned. Please contact Clare Weissflog if you would like to make a donation. This festive, lamp lit evening will also feature some uplifting tunes from Bella Borealis as well as some light refreshments, all in the beautiful heritage Maplewood Hall in the charming hamlet of Oxford Mills. Take a little time between bidding to go for a stroll around the village and take in the Christmas lights and decorations, but don’t take too long as bidding will wrap up around 8-8.30! Get some great ideas for spending your gift-giving dollars locally, enjoy some seasonal food and entertainment and support North Grenville’s entrepreneurs at the same time. The event is free and everyone is welcome. Come out and join us at 6.30 on Tuesday, December 6th at Maplewood Hall, Maplewood Ave., County Rd 18, Oxford Mills! Monies raised will support the 2017 North Grenville Sustainability Fair on April 23rd. On Monday, November 14 SNG members and local energy experts Chris Weissflog and Jeff Goodman gave a talk on understanding your Hydro bill and ways to save energy. A big thanks to Jeff and Chris, and to Grenville Mutual for their generous loan of the Community Room for this event. 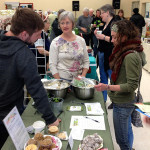 Drop in to the 9th Annual North Grenville Sustainability Fair & Market to learn about local food initiatives and how to produce healthy food at home in an environmentally sustainable manner. Local experts and community members who are leading the way will be sharing their experiences in a series of seminars that form part of Sustainable North Grenville’s 2016 Sustainability Fair & Market on Sunday, April 17th at the North Grenville Municipal Centre, between 10Am and 3PM. SNG has assembled an impressive line-up of speakers and interesting topics. Bruce Enloe will kick off the event at 10:30 a.m by providing an overview of the recently launched Two Rivers Food Hub. People can learn about the services the Hub provides to local farmers and food processors, as well as which fresh, local food products they make available for purchase. As its General Manager, Bruce will not only tell us how far this fledgling organization has come, but also give an outline of plans for its further evolution. At 11:00 a.m Luke Swales will lead a 50 minute session on organic farming. Luke operates his Earth’s Harvest Farm in Oxford Mills using sustainable, rotation techniques that not only provide better natural feed and reduced risk of parasites and disease for the animals he raises for market, but also build up the resilience of the soil. Luke has also introduced new vegetable varieties to our markets. It’s guaranteed that Luke’s enthusiasm will be contagious and will excite you as you learn about sustainable agriculture techniques. At noon, you can find out how you could keep chickens at home. Tim and Margot Allen of Merrickville will share with you their stories, decisions you’ll need to make, what you need to make it work and what you can expect as an outcome. Our 12:30 p.m. speaker is as sweet as they come. Peter Rooney, a bee keeping expert will be discussing the production of honey and how to get your very own backyard hive started. He will introduce the ins and outs of the sweet stuff that will surely keep you buzzin’ to get your own hive started. Kurt Liebe, of Miku Valley Permaculture Research and Projects will follow with a look at farming with nature – instead of working against the land – to create a more symbiotic existence. Kurt’s work focuses on sustainable development in areas ranging from Sustainable Food and Lifestyle to Farm Design and Layout. Be sure to check in for this half hour session on what is up and coming in continuous agriculture. To round out our gardening series, Gerry Baker from Westport and whom many may know from her business work with “The Worm Factory”, will show you how worms can help you turn your kitchen and garden waste into healthy, nutrient rich soil. She is passionate about using earthworms and other soil microorganisms for composting both indoors and out. Join Gerry at 1:30 p.m. and take home some of the wisdom she is sharing, and maybe also bring home some worms so you can begin practicing vermiculture right away! The seminar series “switches gear” at 2:00 p.m. when we change topics completely to Electric Vehicles (EV). Jeff Goodman will provide an overview of the basics before showing what is expected in the EV marketplace over the next few years. New and exciting models are coming with more modest purchase prices, more range, more capabilities, and suited to different needs for different families. If you are at all intrigued by EVs, don’t miss this opportunity to hear it from one of North Grenville’s most enthusiastic EV owners. And the best part is that the presentation will follow a complete EV show that is yet another part of the Sustainability Fair. Owners of EVs like Nissan Leaf, Chevrolet Volt, Ford C-Max Energi, Tesla Model S, and Kia Soul EV will be displaying their cars. They’ll answer your questions and describe what it’s like to own and operate one. Like the rest of the Sustainability Fair that they are a part of, the seminars and EV show are free to attend. Don’t miss this opportunity to learn and make contacts that will help you travel down the road toward a sustainable lifestyle. Mark your calendar for a whole day of family fun at the 9th Annual North Grenville Sustainability Fair & Market on Sunday, April 17th at the North Grenville Municipal Centre, 10 a.m. to 3 p.m.
Children will have lots to see and do while getting their hands dirty in the kid’s zone. Anne Walsh from Art and Soul will encourage children to use a variety of sensory materials to create their own artistic landscape. To inspire children to grow their own food, Diana Steadman from Eat Grow Play Nature Camp will teach children how to use clay, compost, paper pulp and seeds to make seed bombs that can be thrown just about anywhere to foster new growth. For the budding engineer in the family Lego2Learn’s, Dave Melville will bring an extensive collection of Lego for all children to enjoy constructing. Before leaving the kid’s zone children will be encouraged to make a personalized button badge to show their love for the planet. This and many more activities will keep your children happy and entertained. All kid’s activities are free except buttons are a toonie. George Hogan, (10am) native Scotsman, current Kemptvillian, singer of songs and player of tunes starts the day with a set of carefully selected mixed traditional and modern covers played in his unique, high energy style. A great way to start the day! Fiddlehead Soup, (1pm) is a singing, dancing and playing trio of Doug Hendry on an open tuned 12 string guitar, with the mother-daughter combo of Glenna Hunter and Ursa Meyer on a variety of strings and keys. Singing songs from the traditions of multiple countries and in multiple languages as well as their own artfully constructed material, Fiddlehead Soup does an incredible job of making the difficult look not only effortless, but fun! The Ninth Annual Sustainability Fair & Market, brought to you by Sustainable North Grenville, will be held on Sunday April 17 from 10am to 3pm. Among the offerings will be an electric vehicle (EV) showcase. Last year participants were able to see a variety of electric and plug-in vehicles and talk with their owners. Presentations were delivered touching on the vehicles presently available on the market in Canada and considerations for those unsure of whether an EV would suit their needs. Test drives were offered for those interested in experiencing for themselves the silent performance of an EV. Sustainable North Grenville will be repeating these popular components this year and adding even more for participants to experience. Owners of a number of EVs will be bringing their cars to the North Grenville Municipal Centre so people can see, touch, and learn about the cars. Owners can answer questions about range, ownership, lifetime costs, maintenance, and more. Although the line-up is not finalized, owners of the following vehicles are planning to participate: Nissan Leaf, Chevrolet Volt, Ford C-Max Energi, Tesla Model S, Kia Soul EV. Some owners are already turning 100,000km on their vehicles and have experienced all of the conditions Canadian roads can deliver. If you have a question on the vehicles, surely these owners are well-placed to respond. Test drives were well-received last year and Sustainable North Grenville is working with a number of local dealerships to repeat this for 2016. Just like going to a dealership for a test drive, you will need a valid license. Unlike going to a dealership for a test drive, you will be able to compare different cars from different manufacturers all at once. And what better reference than the owners who will be onsite to discuss what they like and what they might improve about their cars? The presentations on EVs last year were mostly about what was available on the market and costs for those considering buying an EV. It seems clear that people are equally interested in “what’s next?” With this in mind, there will be a single presentation given which will cover some core aspects and move into a discussion about what has been happening in the EV marketplace and what is anticipated over the next one or two model years. Plenty has already happened: There’s a new Chevrolet Volt on the market with a 30% increase in the electric range; the Nissan Leaf offers a 30kWh battery for 2016 which is a 25% improvement that didn’t change the dimensions of the battery. The Chevrolet Bolt is expected at dealerships by the end of the year and the Tesla Model III will be unveiled shortly – both expect to deliver a range of over 300km at a price of around $35,000 US. Join us for a gaze into the crystal ball of the near-future EV marketplace. The past criticisms concerning the price of the cars or their limitations due to range and need to recharge are outdated. With the new quick charge infrastructure that already exists in Quebec, you could drive a Nissan Leaf from Kemptville to Quebec City, stopping to recharge for about 20 minutes when necessary. Ontario is moving to introduce these fast charge stations between cities and along the highways in the near future. Last year we discussed how the initial cost of an EV might be less expensive than a modestly-equipped Corolla when viewed in terms of lifetime costs or on a monthly basis. You might find that, all factors considered, an EV that works for your needs and lifestyle is less expensive than the other vehicles on your shopping list. In addition to the cars, we’ll be showcasing some electric power equipment to help with yard work. What kind of performance can you expect? What is the level of battery technology and how has it changed? Nearly a Decade Celebrating Earth Day in North Grenville! Mark your calendars for the 9th annual North Grenville Sustainability Fair and Market! This year’s event takes place on Sunday, April 17th at the North Grenville Municipal Centre in Kemptville. Join us on Monday, January 18th at the Branch Restaurant, 6.45 for 7pm start. Sustainable North Grenville is hosting an information evening that will include three guest speakers on the subject of water resources in North Grenville and presenting sustainable solutions to issues facing the community. Karine Bertrand from SNG will present a broad overview of the state of water resources in North Grenville. A summary of publicly available studies recently completed by the Municipality on the subject of water resources will be presented, and issues facing the community today and in the future will be highlighted. Sustainable methods such as low-impact development and greywater systems will be examined as means to handle the impacts of the estimated doubling of population in North Grenville over the next 20 years. SNG’s Jeff Goodman will provide a short overview of groundwater and move into a detailed examination of the well records available for Grenville. It will be a summary of publicly available information that explores well records dating from the late 1940’s to present. Scott Danford of the Rideau Valley Conservation Authority (RVCA) will present its stewardship programs and how they work to improve the health of water bodies in the region, including the Rideau River, Kemptville Creek, and Barnes Creek. Stewardship assistance programs offered by the RVCA to landowners and farmers range from shoreline naturalization, to reforestation, to water quality improvement projects. Cash bar and snacks by donation. SNG events are open to everyone; no membership required. Water Resources in North Grenville (PDF). Rideau Valley Conservation Authority (PDF). Sustainable North Grenville’s December event is a fun, relaxed evening of candlelit seasonal cheer featuring a fantastic array of goods and goodies from our local merchants and artisans. Join us at The Branch Restaurant and Texas Grill on Monday, December 7th from 6.30pm onwards to enjoy some cheery company and conversation; support sustainability activities in our community AND more importantly snag some fabulous locally-sourced gifts for friends and family! Meet some of our generous donors in person at the event and discover where you can pick up more of their products to complete your Christmas shopping list. We are looking for locally-made crafts, edibles, clothing, cards, soaps or certificates for local goods & services. If you have something you would like to donate to the auction or you know of a local business or craftsperson who might be interested in offering an item or a service then please contact Jeanne at sngfair@magma.ca.